Okey, have lower score than previously, but thanks to new system the reward is better! Did seen combo: Wood Nymph, Water Nymph, Hippogriff and down Clockwork Soldier, Pirate and Skeleton - suprisingly good anti-red set. Another good set can be with Dirt Devils.. as anti-blue. Last edited by Pol on Feb 18 2018, 9:24, edited 1 time in total. It's easier to stay in Gold Tier now there is only one Gold Tier pool of players. My last Challenge before the global changes was Silver Rank 4, and I was promoted to Gold and in the new system. Last edited by Steven Aus on Feb 18 2018, 11:48, edited 1 time in total. I don't think the specials are working good yet... With 5 active dungeons last time there was barely any difference as opposed to running only 1 dgn. Have you personally reported it? Ofc, but since my email password consists of 9786 various symbols and characters and my CH is around 10 it was faster to first report here. Ok, this time I was wiser and save up some diamonds, to shield myself when whales start to climb up on my back. To not to be dusted, like previously, hope one day will be enough. Still, long way ahead, have avg shrines on lvl 23 and that's not enough. Seeing players with Castle/Shrines on lvl 28 just make meh. BTW For 5000 points, there's first real reward. Well, one day paid off, two days would be better. Now, I have a long list of these who defeated me, kinda close to 30 players, ranging from lvl 330 (I'm at 332 myself.) to 500. For most of them I can revenge them back and win. But I don't have so much diamonds. Looking at it as a curve, so after first start, it's just going in tsunami waves, then there's a a bit of peace, with deathmatch on the end. Last edited by Pol on Mar 8 2018, 19:50, edited 1 time in total. Pol wrote: Ok, this time I was wiser and save up some diamonds, to shield myself when whales start to climb up on my back. To not to be dusted, like previously, hope one day will be enough. Good call, it can secure your ranking if you need the 3d creature. If not, I find the lower rewards quite good since 1.7. My dungeon got beaten! Don't know why.. Soon, you may expect more of such visits. Especially some Stickers, some of them can be returning like Earthquake. Last edited by Pol on Mar 9 2018, 20:00, edited 2 times in total. It was only yesterday that I was aware we could peek on the dungeon we want to attack. I was always going rather blind, based on player level and the defending boss. Well, now I'm having less surprises. Anywa, my question is: how difficult it is the quest King level? Prince ranges from 85-95, I think, but haven't tried King yet. I wanna bigga gemzoz! That person has no life. At all. Last edited by Panda Tar on Mar 20 2018, 20:23, edited 1 time in total. 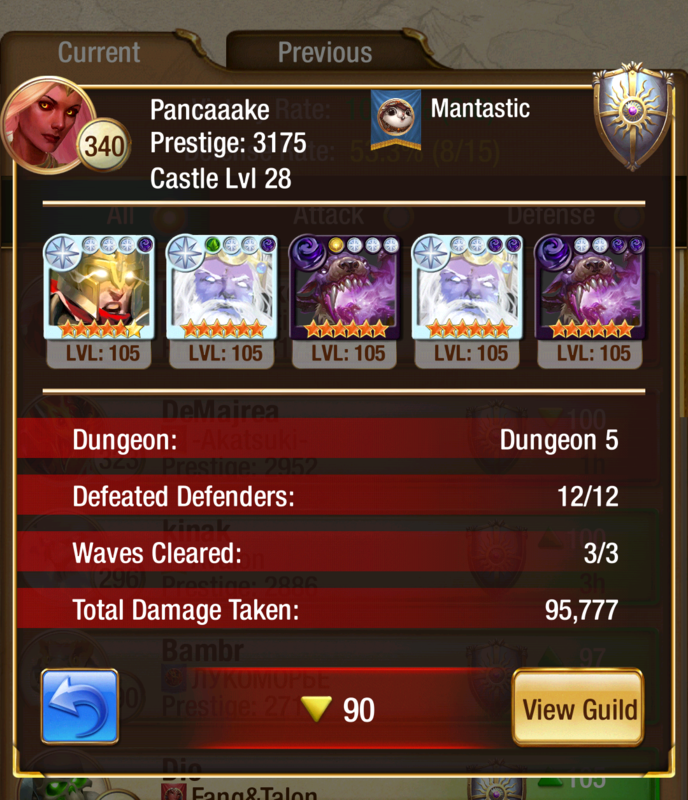 With an anti-colour team, you should be able to manage the Grand Wish quests on King at this point. With the obvious exception of black and white. Especially black is quite tough with the many high damage dealers. I'd range the difficulty of other quests between the b/r/g/y GW quests and the b/w GW. Last edited by wimfrits on Mar 20 2018, 21:25, edited 1 time in total. Black is tough, and I don't have here anti color team. It surely helps not messing around, but it looks like we cannot use diamonds on this one (which, of course, prevents certain abuse). I'm expecting the Kingdom battle feature. Combo Promotion is great too! And that's not to mention all the resources needed to Enchant the Replacement 4d Legendary Creature to Silver or Gold Level, especially since it might take several wasted rolls to get something actually keeping! But it is not so cheap that every Player Creature will be 4dots. So overall, I feel this option is well balanced, like most of the rest of the game. Last edited by Steven Aus on Mar 22 2018, 17:23, edited 1 time in total.